Bravo Construction is a complete outdoor living construction company. We specialize in transforming your backyard dreams into reality. Just think of inviting your friends and family over for a weekend pool party or a summer barbecue. Bravo Construction can help you turn your space into a fully customized entertainment area. Since 2001, Bravo Construction has been creating beautiful backyards that fit your home and your budget. Whether it's a stamped concrete patio, outdoor kitchen, or a rock swimming pool, Bravo Construction has the skill, experience, and ability to give our clients the highest quality craftsmanship available. We are extremely passionate about all the work we do. Be it design, permits and construction or customer satisfaction our attention to detail will not be out done. Bravo Construction is the original creator of BarrelTops. These BarrelTops are top of the line, custom made concrete counter tops that turn a standard wine barrel into a bistro table. We have taken our concrete counter top design, which we have been using on indoor and outdoor kitchens for over 10 years, and created what we call BarrelTops. There are so many colors and different finishes available, the possibilities are limitless, including logo etching of your winery or company logo onto the surface of the top. 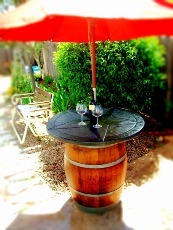 BarrelTops work perfectly for use in tasting rooms and out on the backyard patio. BarrelTops also are easily handled and stacked for storage and transportation. They work great for all events, such as, weddings, banquets, and festivals.